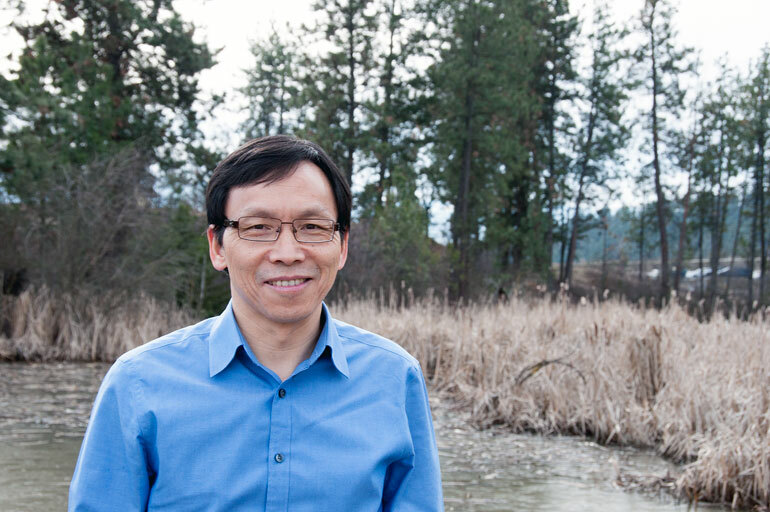 UBC Professor of Earth and Environmental Sciences Adam Wei. A four-year UBC study will look at current forest management practices to determine how harvesting, and natural disturbances—such as wildfires and pest infestations—are affecting the natural balance between carbon and water. UBC researchers are teaming up with Kelowna-based engineering and environmental consulting firm ECORA and the BC Ministry of Forests, Lands and Natural Resource Operations (FLNRO) to work on the project. Forest ecosystems store about 86 per cent of the total global vegetation carbon budget. These carbon storage mechanisms have a substantial role in regulating the global carbon balance and directly impact other ecological systems, explains Wei. The four-year UBC project will study the carbon/water relationship in reforested areas in BC’s southern interior region, but the findings can be scalable to any forest environment. Forests cover more than 40 per cent of the Canadian landscape. In Canada forests and closely-linked watershed ecosystems have undergone significant changes due not only to timber harvesting, but also to other disturbances like the mountain pine beetle infestation and forest fires, of which Canada experiences around 9,000 annually. All of these disturbances mean a change in how forests manage carbon and water processes. Forests are normally carbon sinks, meaning they absorb carbon dioxide from the atmosphere, but disturbances in the natural ecosystem can switch forests to carbon sources. Many studies have examined how reforestation affects carbon, but the UBC study is unique in that in addition to looking at post-disturbance carbon recovery, it will explore other ecological processes like the effect on watershed hydrology and the coupling between carbon and water across different spatial scales. The research team will include Wei; Kelly Sherman, president of ECORA; Dr. Rita Winkler, senior forest hydrologist with FLNRO; three UBC Okanagan graduate students, and three undergraduate students. Wei will supervise students involved in the study while Sherman’s company will provide technical guidance on forest disturbance, reforestation, and forest carbon modelling processes. Winkler, who manages the Upper Penticton Watersheds, will ensure research sites and long-term data are available for the project. Work on the study gets underway this April. The Natural Sciences and Engineering Research Council of Canada (NSERC) is providing $127,125 over four years through a Collaborative Research and Development Grant. Private-sector partner ECORA is committed to $80,000 over the term of the project.